Millions of patients in India seek affordable, quality healthcare. However, a majority are denied even basic treatment due to inadequate and fragmented healthcare infrastructure across India. Only 20% of India’s healthcare facilities are located in semi-urban and rural areas where 70% of the population resides. Limited availability of basic healthcare facilities significantly increases the burden on large public tertiary/referral hospitals: Patients with basic ailments that can be managed by primary healthcare facilities at the grass-roots are forced to travel to overcrowded public hospitals. Compounding the challenge is the limited awareness of basic healthcare practices and treatment avenues among the majority of the rural population. Moreover, prescribed treatment courses are based on incomplete information as the practice of maintaining family medical records has not been widely adopted. While India continues its rapid growth, ensuring quality healthcare for all is a priority. The need of the hour is to focus on building basic healthcare facilities that offer affordable, quality services to people living in semi-urban and rural areas at their doorstep. Karuna will develop a pan-India network of partners and leverage this network to synergize efforts toward common objectives: providing quality diagnosis and treatment, driving healthcare awareness and ensuring consistent monitoring of community’s health practices. Our methodology is to target specific geographical areas and build comprehensive, affordable, quality healthcare services for the communities living in the target areas. Each identified geographical area hosts a Karuna Healthcare Center offering outpatient consultations, diagnostic services and basic surgical treatment. Patients who need advanced treatment are referred to our partner hospitals. All aspects of referral treatment are managed through the Karuna Healthcare Center. The Healthcare Center serves as the nodal point for our awareness activities in the area. We train women members from existing community groups as village-level healthcare counselors, supplementing their income and contributing to women empowerment. Our healthcare counselors are also responsible for monitoring community’s health practices. 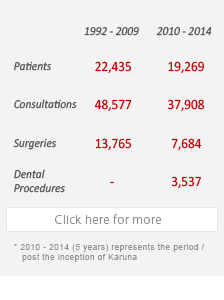 Karuna also endeavors to build and nurture Allied Healthcare Professionals. We provide certified nursing and paramedic training through partnerships with non-profit organizations and accredited Indian universities. In the long term, Karuna aims to build a consortium of credible healthcare providers and channel resources to deliver appropriate, affordable, quality healthcare.